Sometimes I have a sound track running through my head. It is running now as I consider my own changes in thinking about dragonflies. First, I didn't think about them at all. Then an odd moment here, and a weird coincidence there, and I was hooked, sort-of, but flopping and floundering like all beginners, mistake after mistake. Those mistakes are fewer now, and where the danger lies is now more apparent. It has since evolved from an interest in knowing what odes were around where I live to thinking about them in a broader perspective. So when I had a family event in Las Vegas in September, Rita and I chose to skip The Strip and instead rented a car and dashed back into California for birds (a stake-out Wood Thrush) and for odes. We had just enough time to try China Ranch (right), where colorfully bagged dates danced in brisk winds, and then a stop at Tecopa, both in the southernmost reaches of Inyo County. Just outside of the tiny town of Tecopa, the Amargosa River winds through the desert (below). It is not much of a stream but in this arid landscape, all the odes are packed together here, even in September, which is getting quite late in the season. I find my interests changing. From a 'geez-whiz' novice a more serious devotee is emerging. This is both good and bad. I suppose it is a natural transition and yet, boy was it fun when it was just all so new and there was so much to learn! 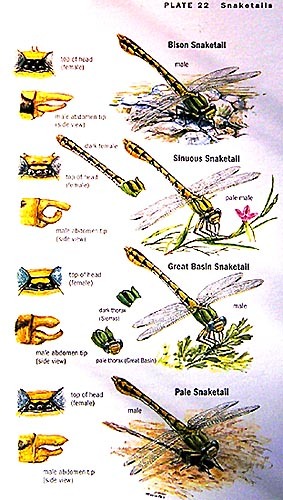 Of course, there is actually more to learn now — the literature, who's who in the dragonfly world, or odonata phylogeny — but these are familiar paths, similar to those in the birding world. I also find myself placing limits on what I want to know. When I was a teenager in high school, and becoming very interested in birding, I used to spend hours going through my Robbins' Field Guide of North American Birds. This had come out in 1968 and was innovative in that the plates were on one side of a double-page spread, with text and range maps on the other page. At the time, the page that most intrigued me was the page on "unstreaked thrashers," painted by Arthur Singer (right). At the time, the pages of colorful eastern warblers did not make a dent — I didn't have the resources to go back East. But Arizona! I was going to drive there on my own the minute I turned 18! I was fascinated by the thrashers because they looked cool, and because they were similar (but identifiable) and sorted themselves out by habitat. Wouldn't it be great, I recall thinking, to see all these thrashers? It didn't take me that long in the 1970s to see all the thrashers — indeed, by the end of that decade I'd seen all of them within California [where Curve-billed is a vagrant, but all the others locally breed]. Thrashers aren't special to me any more. They are still fine birds — as are many others — but the mystery is gone. But I remember longing to see them way back when . .
Now I find myself repeating some of the same steps and emotions as in my youth. 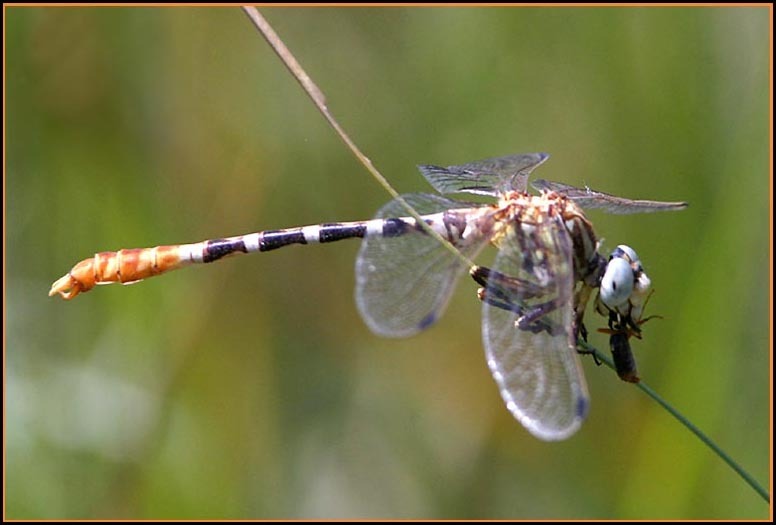 I often flip through Manolis's (2003) Dragonflies and Damselflies of California, studying what is where and when. I read the CalOdes' archives with interest — and now want to go to places like Pine Flat Road, Willow Lake, Cooper Swamp, and West Pond. Ironically, I've been to West Pond many times as a birder. Now I'll go back with new eyes. Yet I am unconsciously placing limits. I currently desire to see only the dragonflies and damselflies of California. I have a book on world odes and know there are ~6000 species. I have no chance of seeing a great many of them. I've spent almost all of my adult life traveling and finally reaching my goal to see half the birds of the world (5000), and there are still more birds to seek out. But the time and money is not there to repeat all those trips with a focus on dragonflies. So, although it is nice knowing about the diversity across the globe, it is just not important to me to see them. I'm sure I'll notice odes on future travel, but I can't see them becoming important in the way birds are. California is another matter. There are only 110 species (with Striped Saddlebags just added this month at West Pond), and a goal of seeing at least 100 of them is quite reasonable. And, like in my younger days, I find that I have a fascination with one particular page in Manolis (2003) — the 4 species of snaketail (left). All gomphids seem elusive here in Monterey County, and there appears to be but a single record of Bison Snaketail in the county. So the snaketails require travel and timing — and the search for them sounds like great fun. Like the thrashers, they are not as gaudy as some other species, and the four of them are similar (but identifiable). They (apparently) separate out by habitat up in the northeastern part of this State. So it has become a goal to see and photograph the four snaketails. If I couldn't laugh I just would go insane. Manolis, T. 2003. Dragonflies and Damselflies of California. Calif. Natural Hist. Guide 72. Univ. of Calif., Berkeley, CA.